Get the big picture on health care facility safety -- and save 15% -- with the combined power of the 2012 NFPA 99 and Handbook Set! 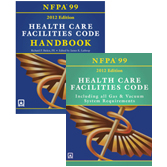 Be fully prepared to maximize safety for patients, staff, equipment, and facilities with the 2012 NFPA 99: Health Care Facilities Code and Handbook Set. Order today and be ready to meet today's challenges with the best value on the field's best resources. Work smarter and more efficiently. Save time, money, and lives with the 2012 NFPA 99 and Handbook Set! Engineers, facility managers...AHJs...plumbers...gas and vacuum system installers, designers, and verifiers...security personnel...insurance companies...manufacturers -- anyone whose job involves health care facility safety needs this powerhouse Set. Starting in 2012, NFPA 99C will no longer be a stand-alone document. Instead, NFPA® provides these options.